As in previous years, here are some of my favorite images, flying memories, and a bit of self reflection from the previous twelve months. Since buying my airplane in 2004, I have targeted a total of 100 flight hours per year. In 2012, I just barely squeaked past that benchmark: 100.2 hours for a lifetime total of 1109.1. There are a number of reasons for this year's lower number; they will become clear later in this post. If last year was the "year of the cross country", 2012 was the year of the short hop. Flights in Warrior 481 did not go beyond New York, Pennsylvania, or Michigan. The number of landings per flight hour in 2012 reflect this: 2.0 versus 1.2 in 2011 (i.e., I spent much less time in the air between landings in 2012). I flew 45.7 hours of cross country, about 57% of what was flown in 2011. Highlight #1: I took 1.0 hour of dual instruction in a glider! I have been wanting to explore this mode of flight for years. This was way cool, even if I need to learn how to not over control the glider. On my second tow aloft, I did not do so badly! Highlight #2: We took a very satisfying family vacation by airplane to Sleeping Bear Dunes National Lakeshore and Mackinac Island in the northern part of Michigan's lower peninsula. Not only were the destinations wonderful to visit, but the en route photos we obtained of the Lake Michigan and Huron shorelines were absolutely beautiful. It was the kind of trip that can only be made by light aircraft and, more than any other time in 2012, I truly appreciated having the good fortune to possess such a capability. Highlight #3: The Bear accumulated 33.9 hours in 2012 and took the controls of the airplane for the first time. I had been biding my time, waiting for her to grow tall enough to actually see out the window and observe the impact of her control inputs. The wait was worth it. That grin still gives me goosebumps. Highlight #4: I began working on my instrument rating. I'm about halfway there - a total of 24.5 hours under the hood with an instructor or safety pilot and 0.3 hours of actual IFR. I have a few (15) approaches under my belt, including ILS, VOR, and GPS approaches. I have learned most of what I need to know and now I need to tighten up everything (which should be much easier now that the VOR antennae in Warrior 481 are properly grounded). Unfortunately, a number of factors contributed to my inability to complete the rating in 2012. This, of course, brings me to the disappointments of 2012. Lowlight #1: I did not finish the instrument rating. Real life, weather, and aircraft availability (see below) all impacted my ability to finish the rating. I will make a focused effort to finish up in the first half of 2013. The good news? I know I can do it, I just need to hone the skills, build the time, and get it finished. Plus, my CFII, Tom, is awesome. Lowlight #2: The fire. The good news is, I believe the mechanical issues that fostered the fire in the first place have been fixed and, over time, my confidence in the airplane has been repaired as well. Lowlight #3: Dealing with a remote maintenance shop after the fire. If anything almost made me lose faith in the entire general aviation enterprise, this was it. I am happy to report that the massive amount of help and support that I received from my fellow Le Roy pilots and my regular maintenance facility restored that faith in spades. Lowlight #4: I was actually grounded early in 2012 for medical reasons. I am now flying on a special issuance medical (I feel so special). My AME was able to resolve the issue with a phone call to the FAA in Oklahoma City such that my grounding was brief (if emotionally distressing). Once I go through the renewal process in early 2013 and am certain that I understand the nuts and bolts of the whole matter, I may post more about it. I made another visit to the always-fun airshow in Geneseo, NY. 2012 was the first year in which I maintained my night currency all year, even through the long days of summer. I visited two new aircraft museums in 2012: The Empire State Aerosciences Museum near Schenectady, NY and the Wings Over the Rockies Air and Space Museum in Denver, CO. The former was a terrific day trip in the airplane, my first flight out of the local area "solo" with The Bear. The latter was simply one heck of a nice museum and, with Harrison Ford as its spokesman, it should be! 2012 was the ten year anniversary of my passing the private pilot check ride (September 23, 2002). It is difficult for me to believe that I have been flying as a certificated pilot for an entire decade. I took more dual instruction in 2012 than I have received in years. I flew with Tom for my instrument training, Bill to complete a WINGS phase, and Elliot in the glider. For me, it was very gratifying for my flying to undergo such a significant amount of scrutiny from CFIs. I learned many new things from each them that I can apply to my flying, yet none of them noted any significant bad habits or deficiencies that have developed over the past decade. 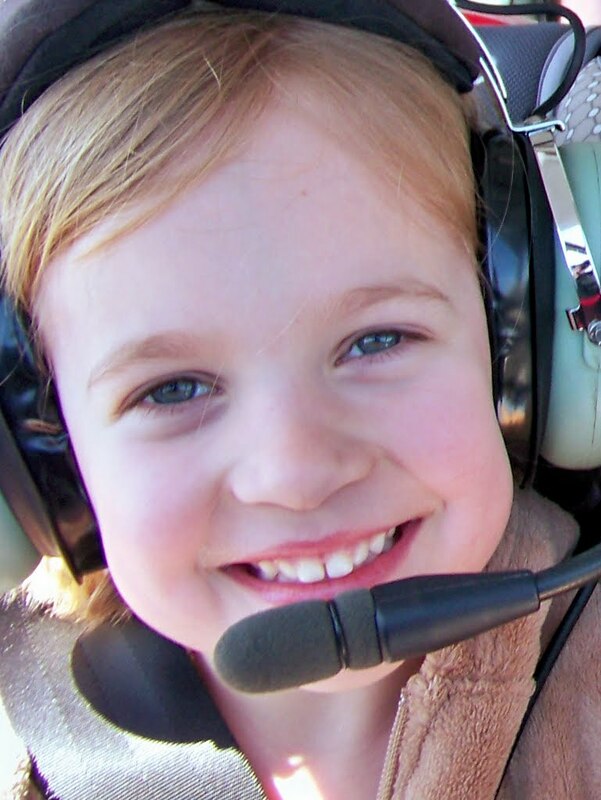 I end 2012 a safer and more confident pilot than I began and that is always a wonderful thing. I even got to ride as a passenger in several GA aircraft, something I do not do often. Whether it was riding back seat during Darrell's IFR lessons, flying home with Ed V. in his Arrow, or hitching a ride with Ed B. in his Tri-Champ to retrieve my airplane from the other side of the state, sometimes it's nice to just ride along. It's been years since I've done that regularly. 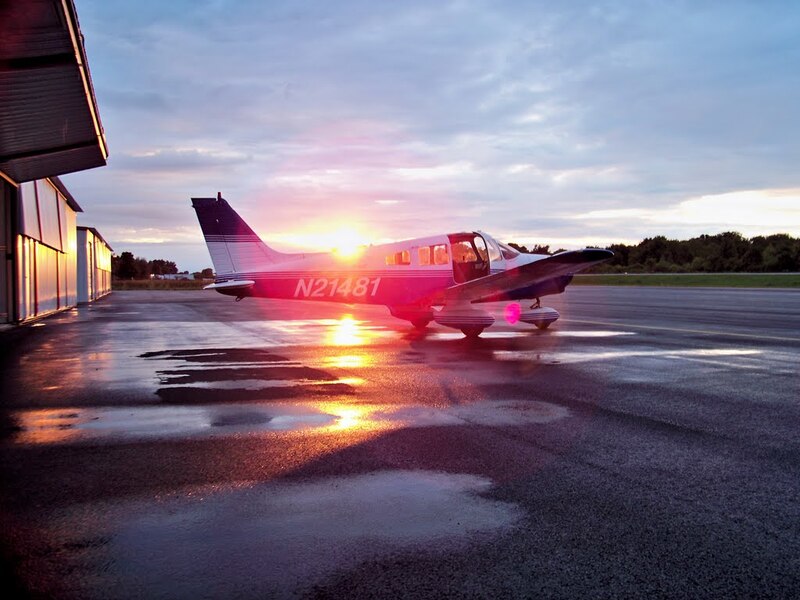 Looking forward to 2013, in addition to finishing the instrument rating, I hope to introduce more people to general aviation. I have flown a lot of rides over the years, but slacked off in 2012. Part of this was a belief that, if I were to go flying, I should be making progress on the instrument rating. I think that, more than anything else, this attitude limited my hours rather than facilitating any progress on the rating. I need to get back to sharing the general aviation experience with others in 2013. I am also looking forward to flying farther away from home in the airplane and exploring new places. Kristy and I are already brainstorming destinations for a 2013 flying vacation! 2012 was a decidedly mixed year for me. But, in the end, I finished 2012 more knowledgeable and experienced than I began it. No stagnation here! I left Warrior 481 cold and alone in the hangar for much of December, which is a terrible thing to do to an honest airplane. Finally back from my travels to Vienna and Disney World in Orlando (oh, the contrast! ), I waited for a break in the weather to get the airplane back into its native environment. That break came on Christmas Eve day. I flew south to Letchworth State Park to test out my early Christmas present, a Nikon Coolpix S8200 point-and-shoot camera (14x optical zoom, image stabilization, 16 megapixel CCD). 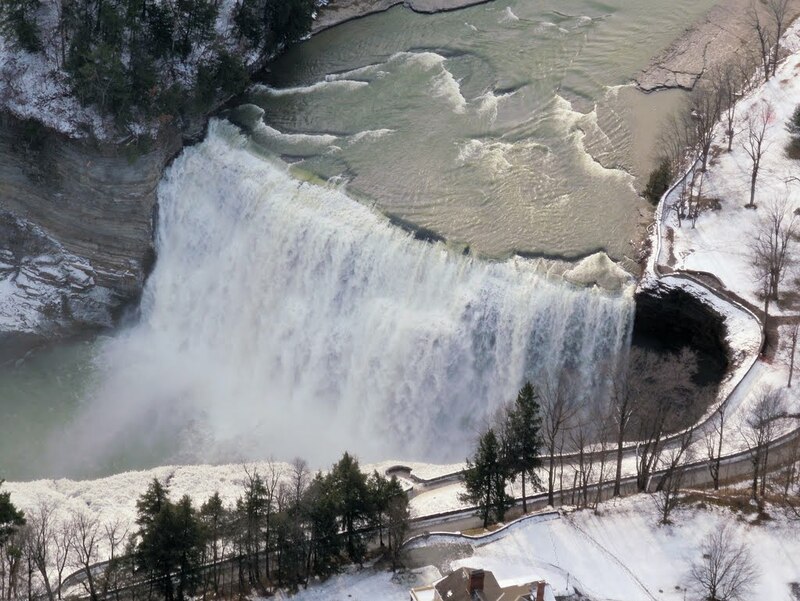 In light chop, from 3000 feet, Middle Falls at Letchworth nevertheless came through clear and crisp. The Kodak I have used for the last three years was having issues, so this gift from my wife and in-laws (mother, father, sister and brother...thank you!) was very timely. 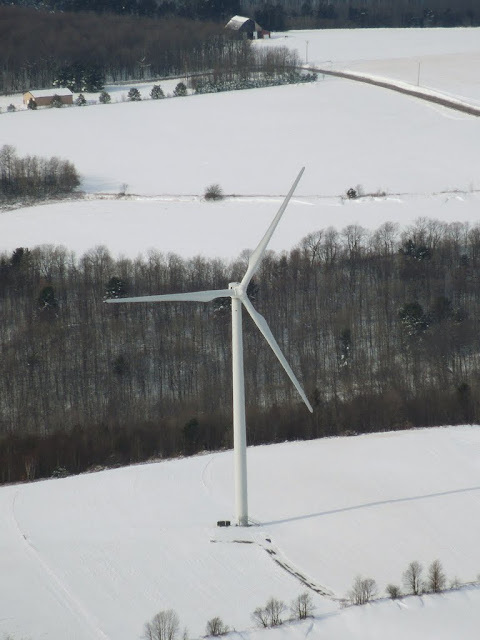 A windmill, photographed from two miles away. Though the day was hardly a test for how the camera might capture color, it took nice sharp pictures. 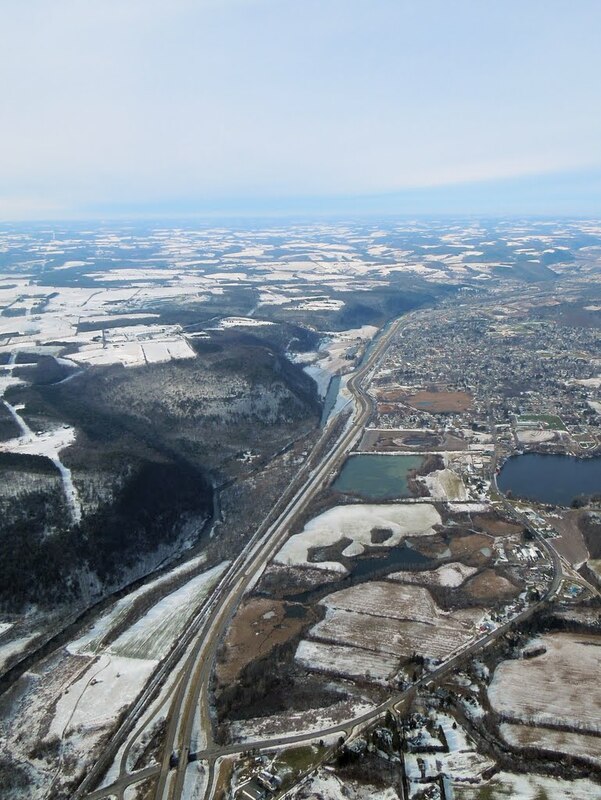 I-86 running through Bath, NY. 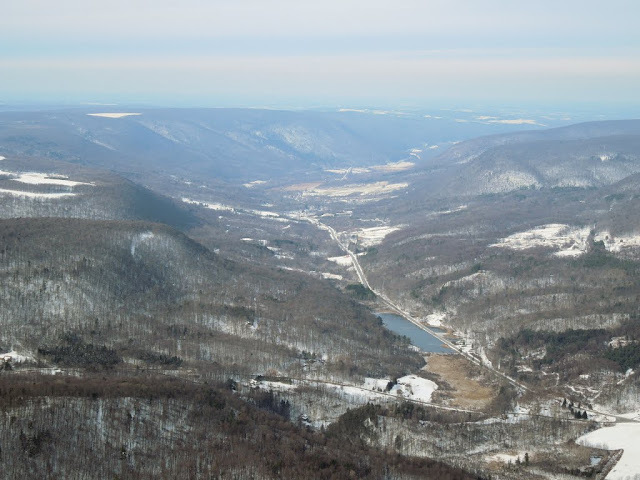 Hunt Hollow Road and surrounding valley. 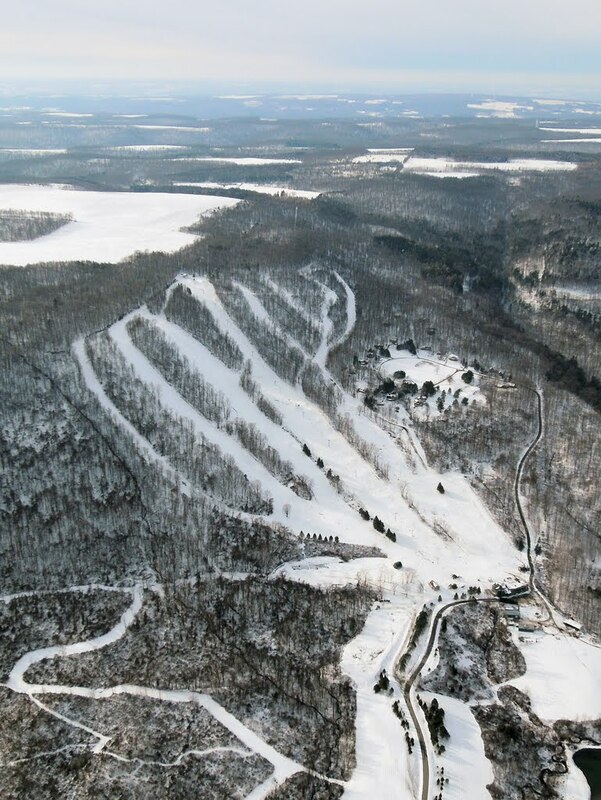 Hunt Hollow Ski Club just west of Canandaigua Lake. Warrior 481 and I flew low over the terrain, following valley highways southeast toward Corning, NY and the Painted Post airport. As I shut down at the fuel pump, I was met by a lineman from Costa Flying Services who explained that the self-service pump was overcharging people who used their own credit cards. He swiped the FBO's credit card at the pump and assisted me in fueling the Warrior. When finished, I followed him inside to reimburse the FBO for the fuel. Once a receipt was generated, he showed me what I owed versus the price that using my own card would have brought from the self-service pump. He saved me about $20. Nah. I thought, shaking my head. Couldn't be. I thanked him for his help, wished him a Merry Christmas, and returned to the sky. I accomplished very little general aviation flying after Thanksgiving this year. One reason for that came when I was invited to present at a conference in Vienna, Austria as a representative of a non-profit consortium to which I belong. Nothing makes you appreciate flying your own airplane like a day's worth of travel peering out of a porthole on the side of a flying Greyhound. I departed on Sunday, December 9 at noon (EST) and arrived in Vienna around noon local time (UTC+6). Kudos to Austrian Airlines, which piped Strauss' Blue Danube into the cabin upon landing at Flughafen Wien. Very classy; it was just like the beginning of 2001: A Space Odyssey. From my room on the 15th floor of the NH Danube hotel, I could see that the ancient city lay beneath a leaden overcast. My hotel overlooked the famous Danube (Donau) River and stood next door to the Vienna United Nations complex. The wind was howling, temperatures hovered around freezing, and pedestrians were pelted with occasional flurries. Not exactly perfect weather for a walking tour of the city, but I set out anyway. Before departing Rochester, I reviewed maps of the city and committed critical elements to memory. My hotel was approximately five miles from the inner part of the old city, demarcated by the Ringstrasse where the old thirteenth century city wall once stood. From my reading, I learned that Vienna is a relatively safe city. Indeed, I saw no seedy areas and it was remarkably pedestrian-friendly. My journey led across the Danube via a walking path beneath Wagramerstrasse. Once across the mighty Danube, I encountered the St Francis of Assisi Church (Franz von Assisi Kirche). Monuments dot the city, like this one dedicated to Wilhelm von Tegetthoff, a nineteenth century Austrian Admiral. Progressing toward the city core (District 1), I crossed the Danube Canal. My objective was to reach St Stephen's Cathedral (Stephansdom), a dominant feature of the Viennese skyline for centuries. St Stephen's was originally consecrated in 1147 and the structure grew over the next two centuries. The structure is so massive that I can only present it in vignettes. There is no place one can stand to place the entire structure in frame. The cathedral is undergoing restoration, having survived centuries of use and near destruction at the hands of retreating Germans at the close of World War II. Though blackened by pollution, the Cathedral is nonetheless an amazing example of architecture in the ancient city. The distinctive colorful tile roof is adorned by the double-headed eagle coat of arms of the Habsburg dynasty that ruled the Austrian Empire from 1526 to 1804. 1. Nobody sounds like Arnold Schwarzenegger. 2. Pictures of Brad Pitt and Bruce Willis are EVERYWHERE. 3. 80's music is very popular. Favorite examples include a car that passed me while CRANKING Steve Perry's "Oh, Sherry" and Jermaine Stewart singing "We Don't Have to Take Our Clothes Off" in the elevator of my otherwise very classy hotel. Cherry wine, indeed. Some of the magnificent structures of Vienna are very difficult to photograph owing to narrow streets in the old city. St Peter's Church (Peterskirche) is a terrific example. The city was well-decorated for Christmas with large lighted structures hung over many of the streets. Eventually, I reached the former Imperial Palace (Hofburg) of the Habsburgs. Here in Josefsplatz, I encountered a statue of Josef II, Holy Roman Emperor from 1765 to 1790. One building bordering Josefsplatz was once the Imperial Court Stables and now houses the Spanish Riding School. Josef II was the brother of Marie Antoinette. Obviously, the fellow came from a politically-powerful family, an eighteenth century version of the Bushes. This is a portion of a magnificent entrance to the Imperial Palace from Michaelerplatz. Michaelerplatz, including a portion of the Imperial Palace. A fountain on the side of the Hofburg. As I studied the sculptures outside the Hofburg, I heard Bruce Campbell's voice in my head. "Hail to the King, baby." Anyone who decorates their front door with statues of Hercules is either trying to send a message or compensate for something. Michaelerplatz entrance to the Hofburg. A rift in Michaelerplatz explicitly shows how civilizations have built on top of one another over the centuries. The lowest levels of ruins are roman. Another wing of the Hofburg visible from Michaelerplatz. Stepping through the Michaelerplatz entrance brings visitors into a courtyard dominated by this monument to Kaiser Franz Joseph. In the Heldenplatz, outside the Hofburg, Erzherzog Karl rides forever. This newer portion on the Hofburg (Neue Burg) contains the Austrian National Library. This is way nicer than the strip mall containing our local library. Lion statue outside of the Neue Burg. The Neue Burg is "guarded" by a complement of statues along its length. This is merely an example - all of them are unique. ...and came face to face with Wolfgang Amadeus Mozart. The humble back door of the Neue Burg. Also attached to the Hofburg is the Schmetterlinghaus or Imperial Butterfly House. I loved the detailed ornamentation on this gate near the butterfly house. I turned another corner and found myself face to face with the author of Faust (though, frankly, I could have done without reading the painfully overwrought Sorrows of Young Werther in college, a novel that Goethe himself eventually tried to disown despite the acclaim it brought him). Vienna is literally teeming with the ghosts of dead artists and musicians that have made their mark on the world. Not far from the Hofburg is the Vienna State Opera House, completed in 1869 during the end of the Habsburg Empire. The walls of the Art History Museum are adorned with lions and each one is different. My walking tour of the city merely skimmed the surface. One could easily become lost in all the wonderful details. The entrance of the Art History Museum, currently hosting an exhibit from controversial 19th century Viennese artist Gustav Klimpt. A corner of the Natural History Museum. Vienna's parliament building with a statue of Athena standing in front. The Burgtheater. Known to locals as "die Burg", the theater opened in 1741. Another angle on "die Burg". The Vienna town hall or "Rathaus", which seems a rather nasty name for such a magnificent structure. I turned back to the hotel after four hours of touring the city on foot. Snow was starting to fall more aggressively. I waved a fond farewell to my good friend Erzherzog Karl in Heldeplatz before retracing my steps to the hotel. The blisters I earned on both feet were worth it! After giving my presentation on the auspicious day of 12/12/12, we journeyed back to the Rathaus by bus. The largest Christmas Market in Vienna is set up in the Rathausplatz each year. Booths and booths of Christmas ornaments, trinkets, bratwurst, and mulled wine lined the sidewalks. I bought The Bear a little ceramic bear that looked like it might survive the travel back home. The next night, December 13, Alan and I went back out into the city with the intent of touring the catacombs beneath St Stephen's cathedral (above). Unfortunately, we arrived two or three minutes too late to join the tour. Instead, we visited the Mozarthaus which, as the name implies, is the apartment where Mozart lived at the time he composed Le Nozze di Figaro (The Marriage of Figaro). More than any other moment during my wanderings through the city, I was struck by an incredible sense of history; standing there in the place where the genius lived and worked. It was a perfect way to end an all too brief visit to an amazing city.